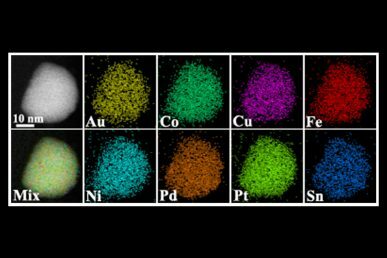 A multi-institutional team of scientists describes a new technique that can meld ions from up to eight different elements to form what are known as high entropy alloyed nanoparticles. The atoms of the elements that make up these particles are distributed evenly throughout and form a single, solid-state crystalline structure — a feat that has never been achieved before with more than three elements. The nanoparticles could have broad applications as catalysts. The findings are published in the journal Science. Traditionally, materials scientists have not made serious attempts to create materials that contain more than three elements because of the tendency of each elements’ atoms to clump together. Scientists also assumed that such multi-element materials wouldn’t have any valuable real-world applications. But now, using advanced transmission electron microscopy, researchers at the University of Illinois at Chicago have proven that multiple elements never before thought capable of forming a single material can do just that. The researchers showed that up to eight elements were able to form nanoparticles — tiny spheres no more than 100 nanometers wide — with a homogeneous crystal structure. “This will really change the way people think about materials that were previously thought to be immiscible,” said Reza Shahbazian-Yassar, associate professor of mechanical and industrial engineering in the UIC College of Engineering and an author on the paper. Materials scientists at the University of Maryland, College Park, led by Liangbing Hu, produced the unique nanoparticles, known as high entropy alloys. “The novel high-entropy nanoparticles could be used in a broad range of applications, particularly as catalysts in emerging energy and environmental technologies,” said Hu, associate professor of materials science and engineering. 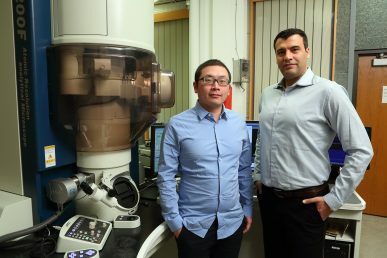 To confirm the homogeneity of the nanoparticles, Zhennan Huang, a doctoral student in the UIC College of Engineering, and Anmin Nie, a former postdoctoral researcher in Shahbazian-Yassar’s lab, used advanced scanning transmission electron microscopy to image the crystals and identify individual atoms. 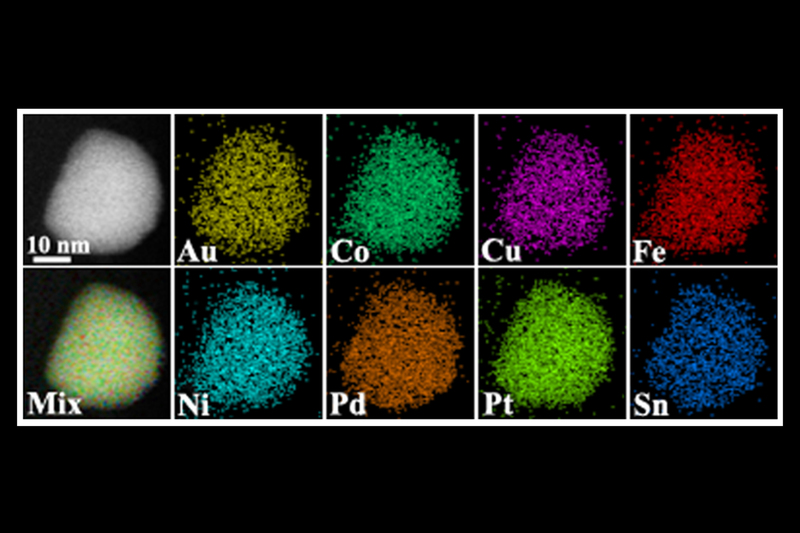 They were able to determine that at the atomic level, their nanoparticles were made of homogeneous mixtures of different combinations of platinum, cobalt, nickel, copper, iron, palladium and gold. “We were able to provide definitive proof that these nanoparticles didn’t have lumps of a single element, but that each of the component elements were distributed equally throughout the nanoparticle,” said Huang. Scientists at Johns Hopkins University were able to demonstrate one potential use of the nanoparticles. They used them as advanced catalysts for ammonia oxidation, which is a key step in the production of nitric acid. They were able to achieve 100 percent oxidation of ammonia with the particles, proving their ability as useful catalysts. Yonggang Yao, Steven Lacey, Rohit Jiji Jacob, Hua Xie, Fengjuan Chen, Miles Rehwoldt, Michael Zachariah and Liangbing Hu of the University of Maryland; Pengfei Xie, Tiancheng Pu and Chao Wang of Johns Hopkins University; and Daiwei Yu and Ju Li of the Massachusetts Institute of Technology, are co-authors on the paper. This research at UIC was funded by the National Science Foundation.